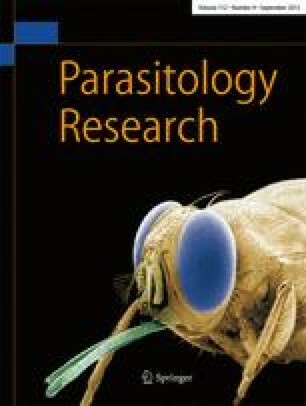 Tungiasis is an important health problem in poor communities in Brazil and is associated with severe morbidity, particularly in children. The causative agent, the female flea Tunga penetrans, burrows into the skin of its host, where it develops, produces eggs and eventually dies. From the beginning of the penetration to the elimination of the carcass of the ectoparasite by skin repair mechanisms, the whole process takes 4–6 weeks. The present study is based on specimens from 86 patients, for some of whom the exact time of penetration was known. Lesions were photographed, described in detail and biopsied. Biopsies were examined histologically and by means of scanning electron microscopy (SEM). Based on clinical, SEM and histological findings, the "Fortaleza classification" was elaborated. This allows the natural history of tungiasis to be divided into five stages: (1) the penetration phase, (2) the phase of beginning hypertrophy, (3) the white halo phase, (4) the involution phase and (5) residues in the host's skin. Based on morphological and functional criteria, stages 3 and 4 are divided into further substages. The proposed Fortaleza classification can be used for clinical and epidemiological purposes. It allows a more precise diagnosis, enables the assessment of chemotherapeutic approaches and helps to evaluate control measures at the community level. This study was supported in part by the Ärztekomittee für die Dritte Welt, Frankfurt (Germany), the World Health Organization (Grant CPE/PVC B2/181/195), Geneva (Switzerland), Bayer Environmental Science and Animal Health, Leverkusen (Germany), Merck do Brasil, Rio de Janeiro (Brazil), and Laboratórios Sintofarma S.A., São Paulo (Brazil). The following individuals contributed with private donations: Michael Peitz, Hamburg (Germany), Mr. and Mrs. Hertz, Reinbek (Germany). VARIG Brazilian airlines provided reduced travel to Brazil in one instance. We appreciate very much the fruitful discussions with Dr. Rômulo César Sabóia Moura from the Mandacaru Foundation, Fortaleza (Brazil), Prof. Pedro Linardi from the Federal University of Minas Gerais, Belo Horizonte (Brazil), and Dr. Olivier Bachelard, University of Lausanne (Switzerland). We thank Dr. Reiner Pospischil for critically reviewing the manuscript and Michi Feldmeier for secretarial assistance. The support provided by the population, the community leaders of the Vicente Pinzón II favela and the staff of the Primary Health Care Centre Aída Santos e Silva, Fortaleza (Brazil), is gratefully acknowledged. The data are part of a medical thesis by Margit Eisele.